Registration is open for May 18-19, 2019 at Living With Dogs in Aptos. If you would like to mail a check please use the form on www.barnhunt.com. To register and pay online use this link. Barn Hunt is the new and quickly growing dog sport catching fire across the country! Barn Hunt is based on the traditional roles of many breeds in ridding farms, barns, crop storage areas, and homes of destructive vermin. Some breeds were specifically created to fill this role, and for many of those breeds, Barn Hunt provides their first true opportunity for responsible breeders to test proper working traits in their dogs. 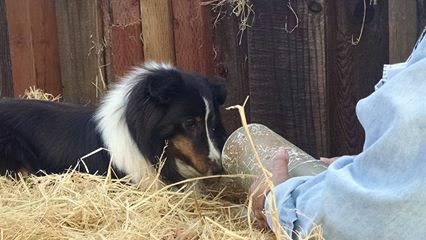 Barn Hunt is also open to any dog of any breed or mix who wishes to play the game and can fit through an 18" wide by bale-height tall tunnel. Barn Hunt has titles, levels of increasing difficulty, and championships. Barn Hunt is an independent sport, but titles are recognized by both the American Kennel Club (AKC) and United Kennel Club (UKC). Barn Hunt is committed to creating a safe and fun sport for dogs, that also holds rat care at the highest level of consideration. The rats used in Barn Hunt are often beloved family pets. They jump eagerly into their safe, comfortable aerated tubes and truly enjoy interacting with the dogs. We're a great sport for older dogs, and older people too! Tripod dogs can compete, and so can deaf dogs. To get started first read the rules, then come out and play with K9 Rat Pack. We hope you try it, we think you'll like it!